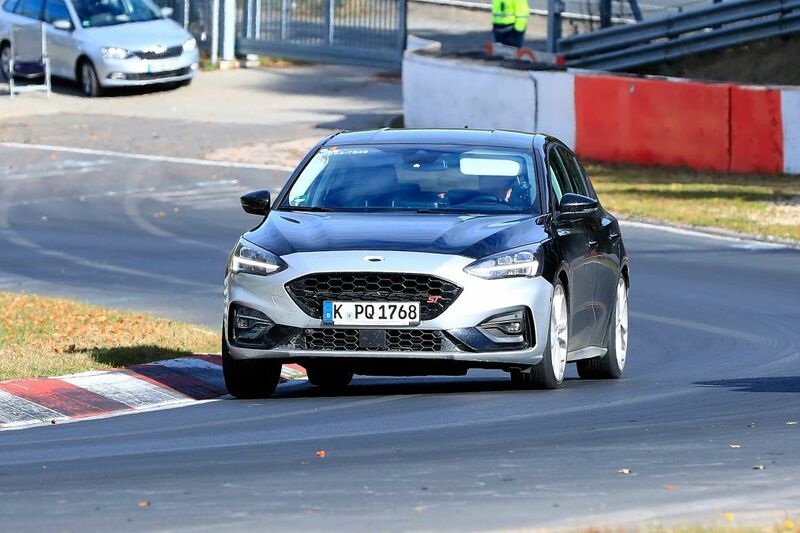 The all-new Ford Focus may have only been with us for a scant few months but Ford is already going through the final testing phases with its hotter, and significantly more a version, the ST. We’ve seen the new ST testing at the Nürburgring before but it now carries significantly less in the way of disguise and we can glean some more details about the car’s design. It’ll need to be good as the new ST is up against some tough rivals from the likes of the next generation Golf GTI (expected in 2020), the Peugeot Sport 308 GTi and more recent rivals such as the Hyundai i30 N. The new Focus certainly has an entertaining chassis in the more powerful models thanks to its multi-link rear suspension set up and the firmer ST-Line models have already demonstrated it can be a fine steer. With more power on tap in the full-fat ST and a chassis that has been further revised and enhanced it should put the Focus back on the performance hatch map until the daddy, the all-new Focus RS, arrives. As far as the new ST’s styling is concerned there appear to be no body in white changes but the front apron has a more aggressive design with more scoops and ducting to bring cooling air to the engine and brakes. The sill extensions look to be the same as those fitted to the ST-Line models but at the rear there’s a more aggressive rear spoiler while the rear diffuser is a new design and features twin-exit exhausts – one either side – rather than the old ST’s centre exit set up. There’s no confirmed word from Ford as to which of its engines will power the new ST but we’re expecting an output in the region of 250-270bhp. It’s possible the three-cylinder unit could be used but it would be right at its limit at this level so we’re expecting the new ST to use a detuned and updated version of the current Focus RS’s 2.3-litre EcoBoost four-cylinder unit which will endow the ST with the grunt required to take on the class leaders. It will drive the front wheels via a six-speed manual transmission. In due course we’d also expect diesel and estate version of the ST to enter the fray, too. We have high hopes for the Focus ST – the new Focus has a chassis that’s clearly capable of coping with more power which should help to bring out its best. 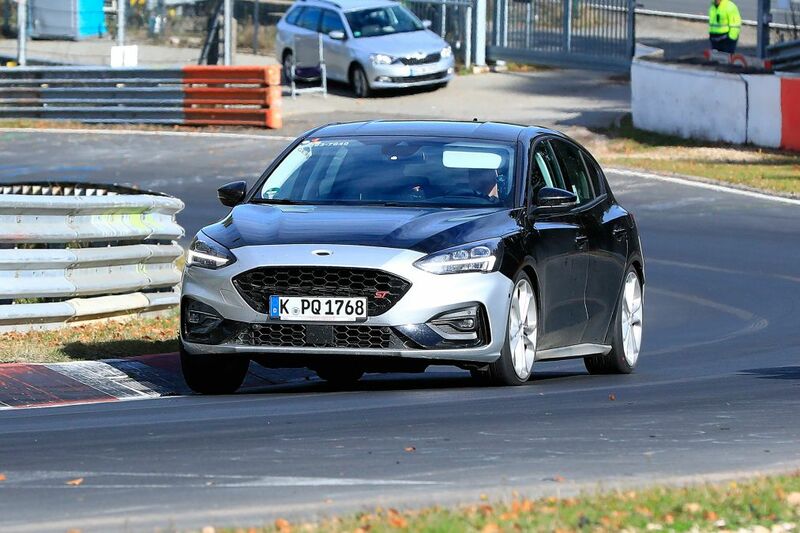 The prototypes caught testing clearly have a lowered ride height and sitting on larger rims and with suitably beefy-looking brakes it hints that the new ST will be a strong performer. The all-new ST will most likely be fully revealed early in 2019 prior to making its motor show debut at Geneva in 2019. Don't get me wrong, its a sharp looking car, but I would never buy that, looks too much like a Mazda. Thieske, HBGeek and NFOCUST like this. I have to agree with this. It just doesn't look nearly as aggressive and certainly looks like a Mazda. Hard pass for me. Definitely does look like a mazda..
At first I liked the wavy design over the hexagons. Reminds me of Ford's more high end vehicles. Then you guys got me thinking about looking like a Mazda & now I cannot ignore it. 2019-20 Mazdaspeed3 with a 2.3T for the USA.. better come with an LSD.. Does any of this really matter anyway, as we won’t be seeing these in the States. Hey Ford how about some more pickups & SUVs. angrychair, Ljc0514 and NFOCUST like this. I quite enjoy the angrier frown-y look of the current ST, the new one looks like it has a dopey smile. Reminds me of the Neon "Hi!" ads from back in the day. I'd love to see it up close as I bet it has a level of refinement that mine doesn't have. Last edited by Pelican of the Desert; 10-30-2018 at 11:36 AM.